I drove by a bar the other day that I drive by on a regular basis and they had changed their sign to read, “Drinkers Wanted.” I chuckled a little bit because I would’ve been all over that when I was drinking, and then I got a little sad. I thought about my life then compared to my life now. And, I thought about all the people out there who are still searching for that “Drinkers Wanted” sign above anything else in their life. Forgive me if this post reads like a stream of consciousness. I haven’t written in a long time, and I feel like the words are coming out faster than I can type them. For ease of reading, I’ll try to condense my topics. Thank you for all your thoughts, prayers and well wishes for my husband, Tyler, and his recovery from neck surgery. He is healing up nice and this morning got the go ahead from his doc that he can start driving again. I’m happy and he’s happy because it means my duty as wife/taxi driver are over and he gets his freedom back. But, in all honestly, I’m kind of sad. As frustrating as it was at times (hectic mornings out of routine, driving twice as much as I would normally drive and shorter work days for him), I’m going to miss our extra time together and our morning chats after dropping the kids off at school. This was one of those lessons in seeing the positive in the perceived negative (which I could always use more of in my life!). Life is B-U-S-Y right now (which explains not writing more). 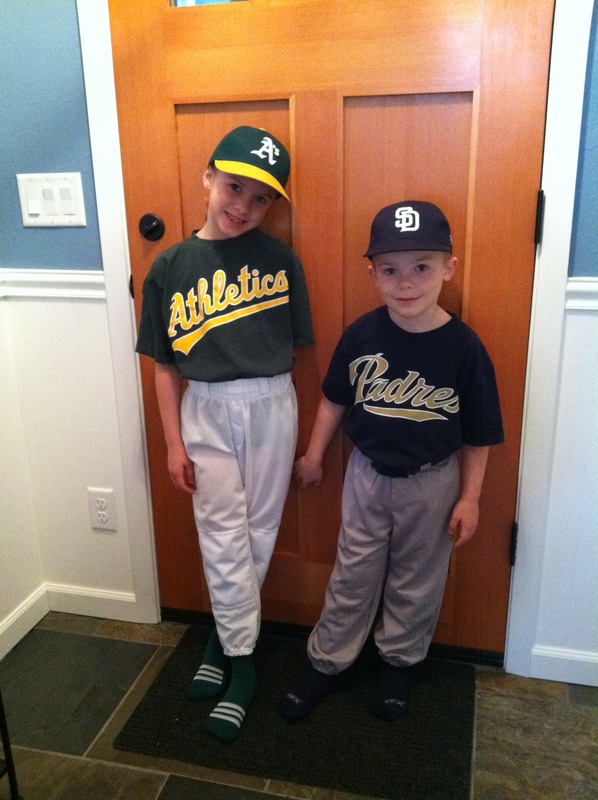 I had NO idea what I was getting myself (actually, our family) into when I signed both kids up for t-ball this spring. I’m not kidding when I say that almost every day/night of the week we have either practice or a game. It’s by far the busiest this family has ever been. A couple years ago when I was drinking this kind of busy would’ve sent me over the edge. Actually, back up. When I was drinking I probably would’ve never even signed my kids up for t-ball because it would’ve seriously infringed on my drinking schedule. So, fast forward to today and I’m loving it! Yes, we’re crazy busy and I barely have time to think and I sometimes feel like I’m in the car ALL day, but I’m happy and I know these days won’t last forever. One day, my kids will walk out the door, waving goodbye and I’ll wonder where the time went. So, each day I wake up and brace myself for another crazy busy day and hope for the best. I’m sponsoring someone for the first time, which has been an amazing experience so far. I write and blog to help others and pass on what I have been so freely given, but it’s completely different (as many of you know) when you’re working with someone face-to-face. I see so much of myself in her when I first began this journey and I just hope and pray I can be an example of what is possible through recovery and working the steps. Holy Week. I have so many emotions and thoughts running through my head right now. This Saturday night I will be baptized for the first time ever at our church’s Saturday night Easter Vigil. As I’ve written before, this has been a long and personal journey for me. And, it truly is just that, a journey. I am reminded of so many years past, but I’m especially reminded of four years ago on the Easter Vigil. It was my grandpa’s 90th birthday and friends and family from near and far had come to celebrate with him. I started drinking early in the day and never stopped. Eventually, my husband put me in the car and drove me to our hotel (with our kids) where I passed out on the bed. I briefly remember my husband trying to wake me, but I was completely out of it. The next morning I woke up to discover that without knowing who got what, he had assembled the kids’ Easter baskets because I was too drunk to do it. Up until then, my husband was one of the few who knew how bad my drinking had gotten, but after that night it was no longer a secret. It still pains me to think about that night and the shame and guilt I felt the next morning. But, it’s those memories that make my upcoming baptism mean even more to me. I know those moments and incidents are not what defines me. I know that change is possible and forgiveness sets you free. And, what means more to me than almost anything is that my grandpa who just turned 94 has been one of my biggest supporters throughout my recovery. Today, I am humble and grateful for this messy, beautiful life I have been given. If you’re at the beginning of your journey, know that despite the shame, guilt and desperation you may be feeling now, there is a light at the end of the tunnel. Just give the journey a chance. Happy Easter, friends – oh, and play ball! Thank you SO much! I’m honored and grateful for your blog. Your honesty in your writing is so refreshing! Thanks again! Sure thing I like your blog to. If your not sure what to do, or the rules for the award check out my post the versatile blogger award it explains everything. Congratulations! Chenoa, I will be thinking of you this weekend when I attend Mass. I am so excited to hear about how the ceremony goes, and how you feel afterwards. Such a powerful thing, to be baptized as an adult! Thanks for sharing your story about your Grandfather’s 90th. I have a story very, VERY similar to that (like the drink at Applebee’s! We are definitely soul sisters!) When you share your pain, you help me to remember mine, which heightens my gratitude for sobriety. So thanks for sharing! And, of course, Happy Easter! Thanks, Josie! I’m excited too. Hopefully, Tyler will get a good pic! Oh, believe me, I’m not always grateful! But, I focus on the progress, not perfection part of that! Lol! Good friends of mine own a bar and we used to joke that, “They’re not alcoholics, they’re good customers.” I was thinking this morning how different my life would be right now if I never stopped drinking. I’d still be a good customer and not much more. It’s wonderful to hear you embrace the sober life you’ve built! Blessings to you this holy week. Thanks, Karen! Honestly, I can’t even imagine what my life would be like if I hadn’t stopped drinking. I’m guessing it would look pretty sad. Blessing to you too! Thanks, Heather! Hugs and blessings to you this week and always! Thank you! Yes, this is an exciting time and I’m so grateful. Just grateful to be here and, like you said, be present in all of it. God is good! Thanks for sharing – I’ve been a busy too – not as much as you it would seem! but it’s truly awesome to see you. Awe, thanks Paul! It’s a good busy, but I wish I had more time to read and catch up on everyone’s blogs. Looking forward to some down time so I can get reconnected with it all. Sponsoring is great – so humbling in itself. I’m grateful. Happy Easter and blessings to you! Thank you for this post. I value each update, Chenoa! And I am glad your husband is doing so well. I’ve prayed for y’all often in these last weeks. Easter 4 years ago is a hard memory – but out of your story I see that husband of yours making baskets and loving you – so much like our Savior. I do believe I’ll give my husband an extra hug tonight in honor of you and your husband – because they are just that excellent caliber of men! Now, how was your baptism? I love feeling the presence of God’s love, especially when I was so sure it wasn’t there (underneath all my pain). Thanks, Lisa! My baptism was amazing. I plan on writing about it once I get a free moment! Kids sports and end of year activities have been keeping us busy!